Hello everyone, as the title says I am the new owner of a 65 Piper PA 28 235. It has a factory remanufactured engine done in 2012 and has about 200 hours on it. It has been repainted about 18 years ago, and the total time on airframe is about 2800 hours. My wife and I have jumped into this adventure and are working on our PPL together, risking of course putting the cart before the horse but we wanted to be trained in our own airplane and plan on using it to see the grandkids and kids who live 300-1100 miles away. We are getting older, late fifties so we had to dive into this thing and get going. It's been fun and our plans are to hopefully become IFR rated at some point, but that will be as far as we will go. We will be flying together I think about 95 percent of the time especially at first. We will rarely carry passengers , except for the occasional airplane ride for fun. I picked the Piper 235 because we are going to be going in and out of airports of 3200-6200 feet so I wanted the extra power and a little more speed. I think it will fit my primary mission nicely. Now for the downside of the plane, It has all original avionics. The question in my mind about upgrading avionics in this plane vs a newer plane has been settled, I don't see the added value trading up for a more expensive plane when this one will fit our needs nicely except for avionics. Yes I understand that a good chunk of the money spent on avionics will not pay off at resale, I suppose I will fly for 10 years so if I enjoy the upgrades that is good enough for me. I have questions about what might be the ideal steps to take and the ideal order. I have a budget of 20-30k. I could go over that by 10 or 20 percent if necessary, but first my goals. I don't want to patch things along and then upgrade, and I don't necessarily want bells and whistles just for fun either. Please give your experienced feedback! I have the following issues and thoughts. The tach is questionable. One fuel gauge is not working. I am thinking about a JPI engine monitor, seems to solve a lot of problems with regards to old gauges. I have studied quite a bit about running lean of peak, must have CHT temp gauges on all 6 cylinders. Yes I know this is very controversial. but I know quite a bit about fuel and the internal combustion engine. Most arguments against the idea have been anecdotal, but I'm certainly open to hearing empirical evidence. It seems like this is my first upgrade. My thought also has included a simple engine CHT monitor and repair the gauges that are older, but is that cost effective? I do like the idea of knowing exactly how many gallons of fuel I have used via the JPI monitor, and of course the accuracy of digital gauges. I think next would be navigation upgrades. This is an area I need to study. I would say my goal is light IFR. I will pick weekends that are nicer weather or we will not go, so we will be flexible. There will be 2 licensed pilots in the plane which will help greatly I am told. However, an autopilot is something I am very interested in. Finally I would look at the radios. I used to have a ham radio license so I know something about this stuff. I plan on avoiding busy and congested airports. I live in South Dakota and most places I will fly will be somewhat sparsely populated. Congrats on the airplane! I’m also a new owner and like hearing other people’s stories. Post some pictures when you get a chance! I believe you could probably get a Garmin 650 GPS, a couple of G5’s (digital HSI and AI), and a fuel flow monitor in your budget. You’ll also want to think about ADS-B in/out while you’re at it. I can’t speak to the labor of putting everything in, but for around $25K worth of avionics, I would think that you could have a pretty decent, modern IFR machine. Lurch, congratulations! I am sure you and your wife will have a ton of fun flying the 235! I was pretty much in the same boat earlier this year, after buying my Arrow. It had traditional vacuum instruments with no redundancy, not even backup vacuum pump. I like to fly IFR and practice to stay proficient, but I did not enjoy the thought of demonstrating my "partial panel flying ability" in actual IMC. So I decided to install two Garmin G5 instruments. For the price they are very capable. Aspen is the alternative, but the feature combination that I wanted (HSI in particular) was more expensive than dual G5s. Besides, I like the redundancy of dual AHARS units. Beware that G5 can serve as a attitude reference for the Garmin GFC 500 autopilot. But it is a great autopilot, and I am pretty much decided to buy it when my old Century IIIC dies, so it was not a concern for me. I have a lot of experience with GFC 700, which is GFC 500 older brother, but pretty much the same "brain", and I never had any problems, it is smooth, precise and reliable. 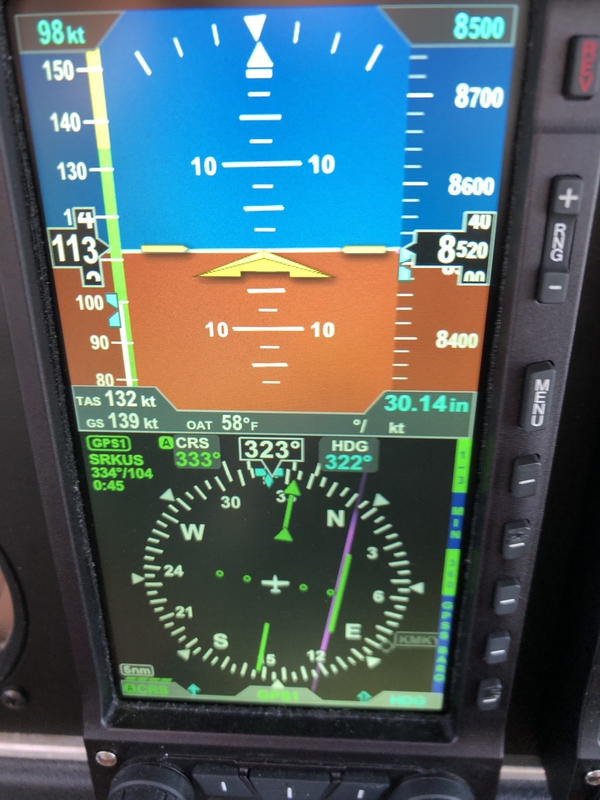 If you plan to fly most of your trips in visual conditions, with your pilot-wife, with only occasional descent through the deck, then you do not need an autopilot right away. But if you plan to fly IMC often, especially solo, it is MUCH easier, and frankly safer, if you have a working autopilot. But first and foremost, get an IFR-certified WAAS GPS and ADS-B-capable transponder. ADS-B traffic and weather are great safety aids! And with ADS-B the whole US airspace will be open for you after 2020. I consider an engine monitor with per-cylinder EGT and CHT probes a safety item too. It just gives you much more insight into the health of your engine than the old, analog probes, and will warn you immediately if parameters get out of bounds. They usually have an option for a fuel totalizer, which is extremely accurate, to a fraction of a gallon. You always know exactly how much fuel you have on board. Operating LOP is not that controversial these days. For example, Continental has this concept of "recommended maximum cruise power". This is the maximum power that you can hold in cruise and put the mixture anywhere you want. This is because at low power setting (about 60% or less) the risk of detonation is pretty much zero, so you can operate as lean or as rich as you want. I think your engine is Lycoming? They are a bit more conservative, but the same thinking applies. If you want to go fast, go ROP best power. If you are not in a hurry and want keep things clean, cool, and burn less gas, throttle back (sufficiently) and lean. That's all there is to it. Piper Owner Magazine has a series of articles about choosing avionics, by Bob Hart. I found them very helpful. You can download past issues from this website. 1. Autopilot mandatory. Without an instrument rating this may save your life. At the very least it will make cross country flight enjoyable. 2. Engine monitor. This will allow you to have confidence in your engine. 3. Navigation. Must have WAAS so a used Garmin 430W/530W or new 650 or Avidyne 440/540 is what you need. Both vendors produce A+ equipment. If you can afford new, get it as support for the used 430W/530W won't last forever. 4. Attitude indicator/HSI. Get an Aspen or Garmin G5 pair if funds permit. That's it from me, I'll just keep my message short. Good luck, post some pics and let us know what you decide. If you want to talk on the phone, I'm available. Jmcmanna-thanks for posting, I will study up on your suggestions. kzadora-You have given me some good ideas, thank you. It's good to hear LOP isn't risky, didn't seem like it could be to me as long as you know the CHT and EGT precisely and run at recommended reduced power. It actually would seem to me to be safer in the sense that there is less chance for sticking valves and fouled plugs. I will check out Bob Hart's articles. Scott-Nice to hear from you, I spoke with you about 8 months ago when I was deciding to buy this very plane. I think it is a good solid start for my goals, and yes I agree the autopilot is a must have. I am going to go with the new stuff as I think it doesn't make much sense to go with older GPS 430/530. I imagine if I decide to sell in the future, the 650 will increase the desirability/worth more than an unsupported 430/530. You did mention that there is new avionics being STC'd (if that is the right term) and many more options are coming shortly. I can afford to go over budget if necessary. With regard to the value of the aircraft after improvements, I'm guessing the avionics will be worth about half in a few years if I decide to trade up to another plane. Seems like the prices drop dramatically after engines are halfway to TBO, so a bit before that might be the best time to consider upgrading. My final thought is moving up to a "better plane" (newer?) with already upgraded avionics. However, the next price jump for a similarly capable plane has older questionable avionics, a mid time engine, and relatively little performance improvements. (at least as far as I can tell) After potential upgrades, I will be into the plane somewhere in the 80-90k range so I have looked for other planes in that price range. PS I've installed shoulder harnesses in the plane as suggested by the flight school. The plane came with copper control cables and gap seals. You got a great airplane, it has a registration 130 earlier than my 67'-235. You must be flying out of Rapid City or Sturgis which would coincide with your elevations that you provided. A 235 provides plenty of power for you even when you have a high density altitude. I'm used to flying with a T.O DA in the 7,000-8,000 range in the Sierra Nevadas. I would echo the statement about an autopilot that was mentioned earlier. Keep in mind that a 235 is a bigger and faster airplane than a PA-28-151 or 140, so stay ahead of it and the wing loading is greater, so it will not float like the lighter single engine planes. Your fuel selector allows for 4 tanks so when switching, be sure you feel the detent and that you are on the tank you really want to be on. I had a student have an "engine failure" over northern California just east of San Francisco Bay and he successfully dead sticked it into Concord Airport. Nothing could be found wrong with the engine or fuel, other than he had just changed tanks. I was not on that flight or I would have checked it myself. I have found that if you fuel the aircraft and leave the fuel selector on any tank other than off, fuel has a tendency to flow from the reserve tanks to the main tanks and then vent out, so turn the fuel selector to OFF when done flying. Check your EGT and look for where the probe was inserted. Mine, for some reason, was in the #1 cylinder exhaust manafold, and the hottest cylinder is #6. I think it was an after factory addition. I am adding a new digital EGT/CHT monitor to the airplane after my TBO O/H engine is back in my plane. If you plan on flying down to Denver or over to Salt Lake City, you will need ADS-B out. I think KDEN is the closest airport to you that will require it. It was suggested that you get a GPS with WAAS, which is where the country is headed, however you should be able to get a good GPS for non-precision approach and LNAV for a very resonable price. I have a KLN-89B and plan on using a skybeacon on either my red position light or my rear tail light. ILS should be around for a few more years for precision approaches when you get to that stage. Good luck and good flying and the Black Hills are one of the few places that I have picked up carb ice, so don't forget to use it. Thanks so much for your comments. I can see you put a lot of time into your response and we all appreciate it very much. bearair-Thank you for your comments. The student pilot who dead sticked it into Concord must have missed the detent and blocked off the port. I have heard of that happening. Next time I'm in the airplane I'll check for the off position on the fuel selector, we are not doing that now when done flying. The annual is due next month and I'm going to put the JPI engine analyzer on it at that time because I don't think (rather my CFI doesn't think) the rpm gauge is accurate. The plane flies 160-180 in cruise, It has gap seals and wheel pants but he thinks that is awfully fast for this plane. We fly out of Rapid City now, sometimes Sturgis and we want to be able to go to Bismarck, Denver, Colorado Springs and Salt Lake City. Glad to hear it gets off the ground easily at high DA. I'm happy to pay a little more for fuel for the extra power. The Black Hills has the craziest weather of anyplace I have lived! It changes rapidly and you have to respect it, that's for sure. My wife and I fly our 64 Cherokee 235 between Colorado Springs and Rapid city often. I think I've seen your plane tin KRAP! 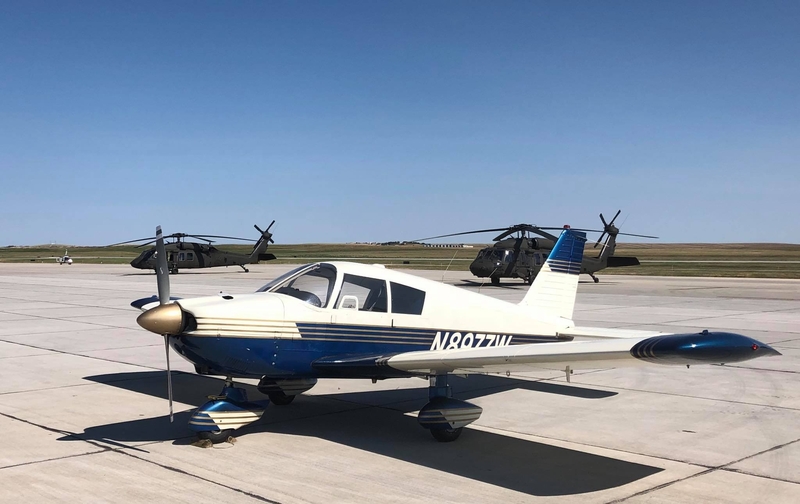 We have and excellent avionics technician here at Meadow Lake airport (KFLY) who I will use to install the Skyview (Mobile Transponders 719-251-8251 Dan Fisher) . We will also install a Garmin WAAS GPS, and Dynon has a very nice inexpensive autopilot setup we intend to install. So we should refer to you as "Mr. April" from now on! I was "Mr. March" in 2017, lol. How do I get my Arrow into the running as a pinup? Every year our editor puts our a call for photos. In case you missed it, you can email our editor, Rocky, with your request at Rocky Landsverk (rockyl@jpmediallc.com). He will be delighted with your interest! Polish your baby and take some great photos next Spring. Get 'em to Rocky and keep your fingers crossed. randyrothe-sounds like we are on the same avionics journey. Email sent. Welcome aboard, and sign up for our avionics webinar on Dec. 19.
your plane will be pictured in our magazine (maybe February issue) and probably in our email newsletter as well. good luck with your avionics! I have to work during the avionics webinar but I will watch It after it gets posted. Thanks for posting my plane, let me know if you need a better picture. I will have to get some good before and after pictures of the panel! whoa ... a lot of great discussion here. the webinar will be at piperowner.org/webinars today. For pictures that can get into the calendar, use our submissions form and I'll save them until next year: piperowner.org/submissions. And yes Lurch your plane is going into the February issue. We'll use the one picture we have from above. if you start to restore/replace, we'll run before/after later. Wow, I don't know what to say. Thanks, I look forward to learning from the group. Now see, I don't understand why carbureted engines can't run LOP as long as all the cylinder head temps are not too hot. That is a significant savings of fuel, and the modern engine analyzers allow us to carefully monitor the temps. I fully realize I may be missing something here, so someone chime in and tell me where I am wrong. BTW, while I am posting, what is with the discussion about not running mogas above 7000 ft? I get the Reid Vapor Pressure argument, but that seems less significant with modern fuels and is fairly easily and cheaply tested for. Stand by, Lurch. I've sent your excellent question to our A&P, Erich Rempert. Why can't my Carburated Engine run Lean of Peak? What allows an engine to run lean of peak is the fact that all the cylinders are evenly balanced, when they are you can get the engine in that sweet spot where its on the back side of the power curve but still running smoothly. This is why most big bore Continentals require GAMI fuel injectors to be able to run LOP, without them the cylinders are not evenly balanced enough even though it is fuel injected. What the problem is, is when the cylinders are not balanced one cylinder will be way leaner than the rest, and one richer than the rest, and the remaining cylinders fall in the middle, you might have a couple that are pretty close. As you begin to lean, and this is especially true if you use a "lean find"
mode on an engine analyzer, you will identify the FIRST cylinder to peak, and then richen the engine from there = ROP operation. This is leaning to the LEANEST cylinder. (last) cylinder peaks, and then note the fuel flow there. That difference in fuel flow, expressed in gallons per hour is the Gami-spread. Ideally you want it to be zero (all the cylinders peak at the same time) indicating that all the cylinders are running evenly. 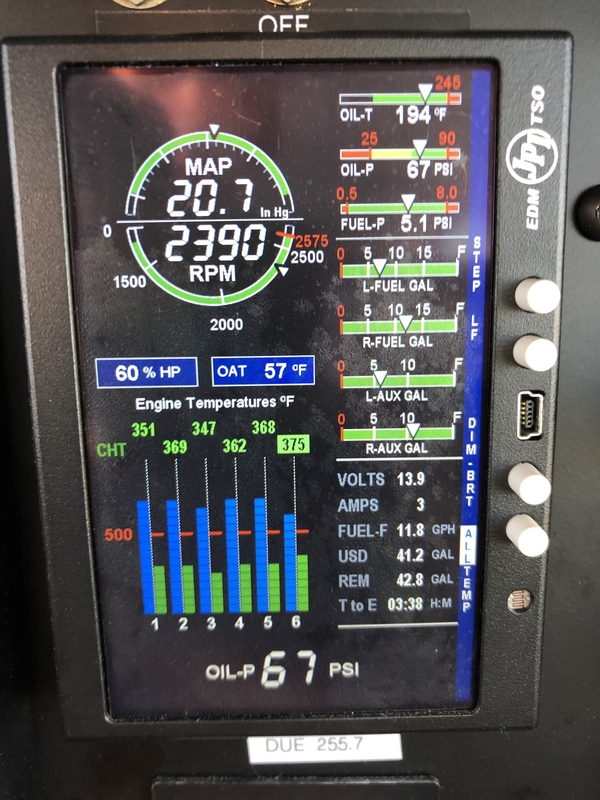 However when they don't, and the spread becomes larger it will impede the engines ability to run smoothly as the fuel air ratio becomes leaner overall. When one cylinder peaks and starts going lean of peak where you want it the rest of them are coming up on peak, as they individually peak and start down the back side your leanest cylinder is now "way lean" and not making power any more, and your richest cylinder is coming up on peak and making max power, and that will create a rough engine which is not something you want. etc) there are inherent distribution differences meaning the supply of fuel/air is not the same at each cylinder. With fuel injection the fuel is sprayed into the intake port at each cylinder allowing for a much more even distribution of fuel, and with an engine analyzer you can tune the fuel injector nozzles to each cylinder to produce an engine that runs much more evenly (GAMI-jectors or similar). If you had an IR system like a Ferrari where you have one carburetor per cylinder and tuned them to be balanced, or a highly tuned induction system (which the modern IO-550 series with top induction has by the way), you could run LOP with carburetion , but otherwise it's just not something the induction system will allow you to do. Thank you for your answer. How is Shanff doing it? Is it not recommended or just doesn't work well outside the parameters he is espousing? My understanding is that the vibration comes from significantly different power levels from each cylinder.